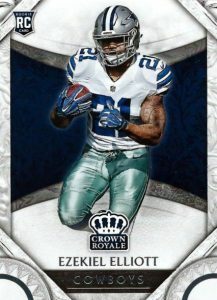 Working with its popular history and brand reputation, 2016 Panini Crown Royale Football returns to collectors for another NFL season, but this time as a retail-only set. Every four-pack box includes one signed card and one relic. Each pack promises a hit or parallel, on average. 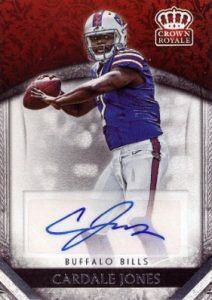 Shifting from the hobby format in 2015, 2016 Panini Crown Royale Football has many of the same elements, albeit with a more truncated list of options. The 100-card base set includes 80 veterans and 20 rookies with five different parallels. Among the choices are serial numbered Bronze, Pink, Holo Bronze, Light Blue and Platinum versions, each limited to 249 copies or less. Centered on the first-year players, 2016 Panini Crown Royale Football also offers Rookie Autographs for nearly 60 players and Jumbo Rookie Silhouette Jerseys for the 40 players at the NFLPA Rookie Premiere photo shoot. Parallels extend to both sets and include Pink and Platinum editions, numbered to 250 or less. Collectors looking for a more premium option can check out the 2016 Panini Preferred Football set that features signed Silhouettes and other hits. 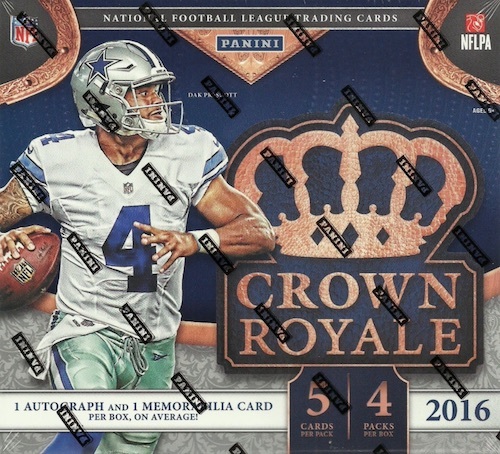 In addition to standard retail outlets, 2016 Panini Crown Royale Football boxes can be purchased from online stores such as SportsMemorabilia.com. 2016 Crown Royale ALEX COLLINS Silhouettes ROOKIE GU JERSEY! #173 250! 2016 Crown Royale JOSH DOCTSON Silhouettes ROOKIE GU JERSEY! The checklist was included as part of the larger Preferred checklist but these cards are exclusive to this format. PARALLEL CARDS: Bronze #/249, Pink #/199, Holo Gold #/149, Light #/99, Platinum #/49. Shop for 2016 Panini Crown Royale Football boxes on eBay. 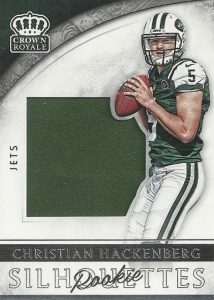 Panini is saving on ink costs now by coloring only half a card. I gave up buying Panini products for myself about 3-4 years ago. I recently purchased a box of this for my 13 year old cousin for Christmas since it’s the only licensed NFL product. I was under the impression he’d receive 1 auto and 1 relic. Mostly because it was on the box and the owner of my lcs said as much. No AUTO, 150 points instead. Panini needs to learn people don’t like or want the points. Especially a kid on Christmas. I need to wise up because now they say 1 Auto and 1 Relic, on average. You got me again Panini. Never again! Same above. No autograph, despite what the box states. Wooooow. I purchased this product at Walmart for $40 cause Crown Royale had been pretty decent in the years past. I got home and looked on this site to see the checklist and read the reviews. It definitely was not confidence inspiring so I then went on YouTube to see some boxes of it busted. I immediately went back to Walmart and returned the unopened box as fast as I could. To start off just as the checklist states there are only 3 different types of cards you can get. The base, a sticker auto and then a plain Jersey relic. All 3 can be numbered but that’s it, no Patch parallels or silhouettes. Upon closer inspection of the checklist I wanted to see how short printed the bigger names were and let’s just say it’s next to impossible to hit a zeke or wentz. Thanks Panini for stealing your customers money with this product. Heck I would even steal this garbage if the door man at Walmart gave me a free pass, seriously. Oh yeah and then it seems your lucky to get the crappy sticker auto as some people have even gotten a 150 save me for later points card that can’t even buy an auto off Paninis store! Horrible! It is a decently priced box at just around $30. The cards are very nice looking. I got a pink and bronze parallel of Darren Sproles and Russel Wilson. I also got a CJ Prosise Rookie Silouhette and I got a Sean Davis Platinum Auto numbered /50. I could sell the contents for at least $30. Well worth it. Crown Royale was one of my favorite sets to buy and build. I started getting into the NFL back in 2009/2010, so I jumped on Crown Royale when it was restarted in 2010. It was a great set as were the following 3 or 4 years. Starting in 2014/15 it began declining. This set being considered the base set for Preferred is just sad. Guess this might be the last year for this set. Sad how it fell so badly. I must have had beginner’s luck, pulled a Dak Prescott Rookie Silhouette’s Jersey Platinum numbered to 50 on my first box ever and straight from my LCS. Outside a handful of the autographs, that’s probably one of the best from the set. However, I did not get an Auto in the same box, like they advertised. I was willing to shrug it off after that pull but it still would have been cool to get what the box said. Honestly, for the price it’s hard to complain about this box. I’ll buy more. (4)2016 Panini Crown Royale Football Factory Sealed Retail Box-8 AUTOGRAPH MEM ! 2016 Panini Crown Royale Football Factory Sealed Retail Box-2 AUTOGRAPH MEM !